The Dhammapada, an anthology of verses attributed to the Buddha has loing been recognized as one of the masterpieces of early buddhist literature. 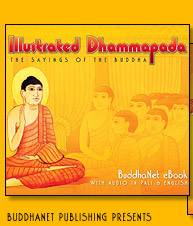 This illustrated Dhammapada lends itself readily to an in-depth study of this religious classic of mankind, to the great delight of both the scolar and the student. 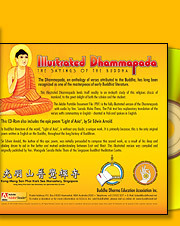 This Adobe Acrobat - Portable Document File (PDF) is the fully illustrated version of the Dhammapada with audio by Ven. Sarada Maha Thero. The Pali text has explanatory translation of the verses with commentary in English - chanted in Pali and spoken in English. This CD-Rom also includes the epic buddhist poem 'Light of Asia' by Sir Edwin Arnold. This illustrated version was originally compiled and published by Ven. Weragoda Sarada Maha Thero of the Singapore Buddhist Meditation Centre. BuddhaNet is a not-for-profit Buddhist education and information service and is supported by donations. This title is available by either making a donation to the address below, or you can now make a secure credit card donation online using the BuddhaNet's new online store.